Do you love to make unique treats for your kids? I have to admit, I love making fun things in the kitchen, especially things that are aesthetically pleasing. The best ones however, are the ones that truly impress all of your guests and are very simple to make. So simple that you can make enough for all of your guests, from start to finish, in less than a half hour! 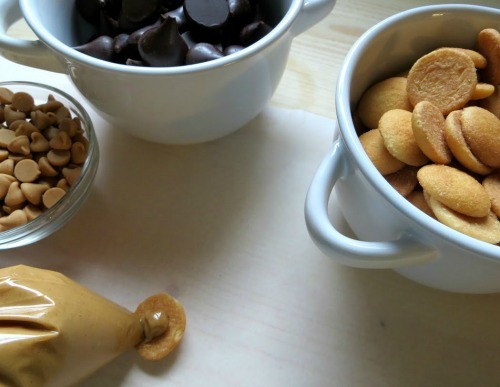 This is one of the reasons why I love our Chocolate Acorn Peanut Butter Cookies. What we love so much about this recipe is that its not only fast, but simple. Kids especially love eating these yummy treats since they include some of their favorite foods – chocolate and peanut butter! You may even be surprised at just how easy this recipe is to make! Make sure to tell us what you think in the comments below! Note: Special thanks to my friends Shannon at Livingston Creatives for helping me with this recipe and pictures! Fill an icing bag with peanut butter. If you do not have an icing bag, fill a Ziploc bag with peanut butter and cut off one of the corners. Slowly start piping a small dot of peanut butter on one of the water bottoms. 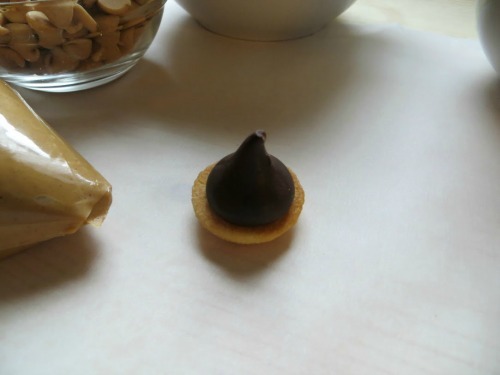 Top the peanut butter wafer with a chocolate kiss. Using the peanut butter bag, pipe peanut butter on one of the peanut butter chips and adhere it ot the side of the water. 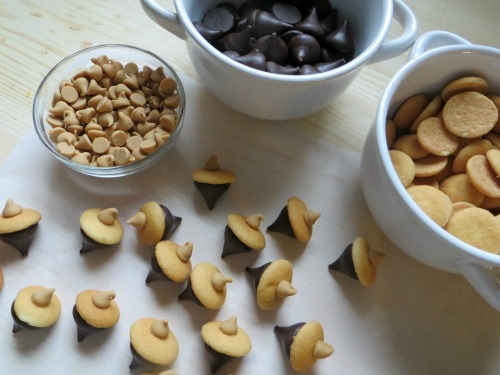 Repeat with remaining ingredients to make your acorn cookies! These cookies are eye appealing & they sound delicious! 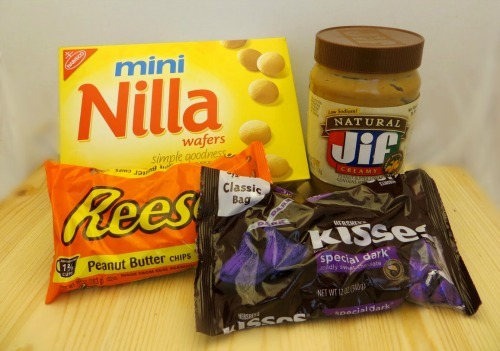 I am going to make some soon since my son loves anything peanut butter! These are so cute! Thank you for sharing these with us. How cute and creative! You can’t go wrong with chocolate and peanut butter. I have got to try these.I really like the small size of each cookie too. These will not last long in this house. Thanks for the recipe. It’s quite the mix of different things you have on this website. Quite interesting to see, thanks for the reading material, even though this particular one would kill me lol!!! What a nifty, easy and fun snack. I’d use dark chocolate chips and are there reduced fat mini wafers?! These are so cute. I want to make them for Thanksgiving treats. These cookies are really cute and creative, I can’t wait to give them a try. Thank you for sharing this recipe. How totally adorable! I am making these for Thanksgiving! Wonderful idea. My granddaughter would love to make these cookies. What a good way to spend some time together. My family loves peanut butter and chocolate. These are a simple and yummy snack. Such a great idea to do with children learning to have fun in the kitchen. Thanks for a awesome idea…they are just tooooooo cute!!! These are so cute! I love butter and chocolate. I like to make pretty recipes like these for our church gathering. These will be on my list for our next church supper. Thanks for sharing. I know what I will be doing with the kids this weekend! These are pretty darn cute and they would have a blast making (and eating) them! These are so cute!! My family will love them!! Thanks for the great idea!! This recipe looks and sounds good and easy. I think that the grand kids would like these and unique for goody trays during the holidays. I want to make these for Thanksgiving dinner sessert. My grandkids wuld absolutely love them, they are so cute! This sounds really taste bud friendly and an easy fix! Yummy!Thanks for the recipe!I will try this. Such a cute idea! I will have to try these out! These are so cute and look so easy to make. I am going to make some for my children. They are going to love them. 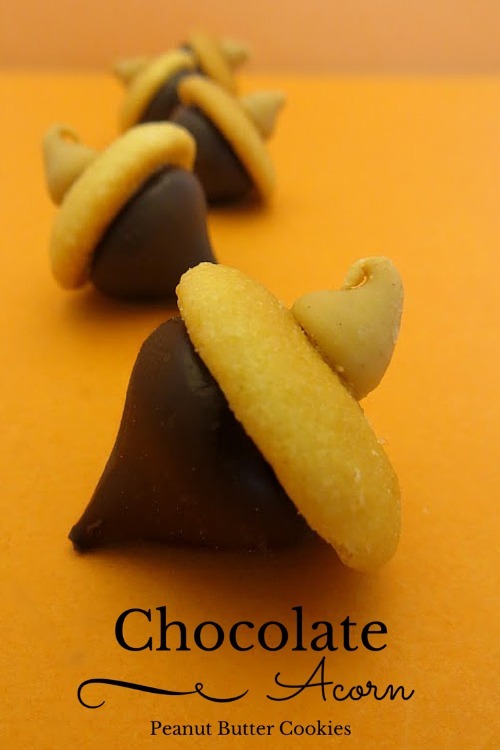 this is a cute idea and love the recipe thanks for shaing this these will be very fun to make and the best part eating them…. Yeah, keeping them from being messy is really tricky!